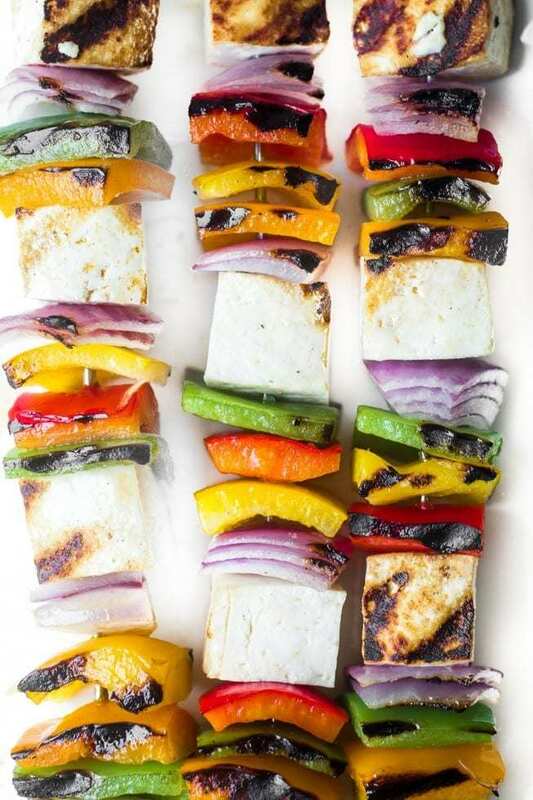 Easy, healthy, and delicious Tofu Skewers are a family friendly vegan meal that can be on the table in less than 30 minutes! Peel and cut the onion into cubes, about the same size as your tofu cubes. Gently separate the layers of onion so you have chunks with about 2-3 layers. In other words, you don't want big thick chunks of onion on the skewers, you want a few layers so it will cook properly. Trim and de-seed the peppers and cut them into similar size squares. Thread your skewers alternately with the tofu, onion, and peppers. Heat a grill pan over medium high heat until it is quite hot. Brush the skewers lightly with olive oil, season with salt and pepper, and lay on the hot grill for several minutes on each side, just until you get some good grill marks and the veggies are starting to soften a bit. Don't be afraid to press down on the skewers a bit to make sure everything is coming in contact with the grill. Serve over rice, beans, couscous, or greens. Drizzle with the sauce. To make the sauce whisk together equal amounts of soy and vinegar, then add a few drops of sesame oil to taste.